Call Governor Perry at (512) 463-1782 or use his webform to email Governor Perry. And the online action is here. We’d like to ask for your help to save an innocent man’s life. 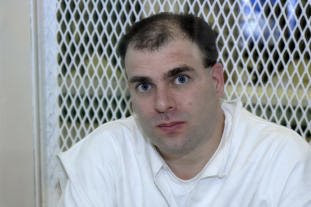 Larry Swearingen is scheduled to be executed on January 27, 2009 by the State of Texas despite the fact that he didn’t kill anyone. Larry is in URGENT need for IMMEDIATE PUBLIC ATTENTION on his case since the courts ignored the brought up evidence which shows clearly that he was jailed on unrelated charges while the victim in this case got killed and her body dumped in the woods. Please take a minute to sign his petition. You can help by spreading the Petition link on the internet. You can send letters, e-mails, faxes or make phone calls to the local, national and international media, TV and radio stations. Raise your voice and express your displeasure and anger about the injustice taking place in this case. The media has to point a finger at this outrageous crime that the State of Texas plans to commit against a wrongly convicted man before it’s too late!! urging them to not execute Larry Swearingen! We oppose the death penalty unconditionally in all cases since it is an affront to human dignity. However, the execution of an innocent man is the ultimative catastrophe in a civilized country and society since it can happen to any of us. The cases of Troy Davis in Georgia, Jeff Wood and Kenneth Foster in Texas shown so far what is possible when people stand up, and we’re watching the development of these cases intently from Europe. Today we’re turning to you with our plea to please stand up and raise your voice for Larry Swearingen to stop the insanity of state sanctioned murder.